In the past several years, multiple sources have recommended yeast products for inclusion in equine diets for many purposes, including improving fiber and phosphorus digestibility, increase feed efficiency, support hindgut bacteria, and even prevention and cure of gastric ulcers. However, a close look at the published data available on the efficacy of supplementing yeast culture in the diets of horses does not support the claims of positive effects in horses fed quality diets that meet nutritional requirements. AAFCO defines a number of yeast products as feed ingredients, including dried yeast, yeast culture and yeast extract. Dried yeast may be either active or nonfermentative. Yeast culture is a dried product composed of viable yeast cells and the media on which it was grown. Yeast extract is a dried or concentrated product of cell contents from ruptured yeast cells. Studies in ruminants suggest that addition of yeast products to ruminant diets promote bacterial growth in the rumen. It is generally believed that yeast additives either directly facilitate fiber digestion and dry matter intake, or contain metabolites or compounds that stimulate bacterial growth to facilitate fermentation and animal performance in ruminants. Since horses have fermentative capability in the hindgut, it has long been proposed that yeast products may have beneficial effects on digestion/fermentation in the hindgut, resulting in enhanced fermentation and increased fiber and/or nutrient digestibility. According to the 2007 National Research Council’s Nutrient Requirements of Horses, “Unlike observed effects in ruminant studies, supplementation of yeast in horse diets tended to show some beneficial effects on fermentation, but results were equivocalacross studies.” There is great variation in published results of feeding yeast products to horses – most studies report minimal to no increase in cecal or colonic bacterial cultures as a result of feeding yeast products, although a few studies have reported beneficial effects when yeast products were fed with very high starch diets, or with low quality forages. 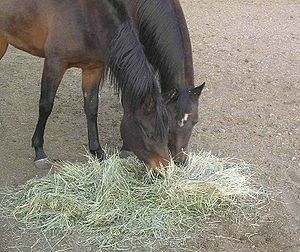 Some studies have reported no improvement in nutrient apparent digestibility when yeast products were fed to mature horses, but others have reported some improvements in fiber and nutrient digestibility. However, the reports of improved digestibility of nutrients with the addition of yeast products are most often seen when yeast products are added to nutritionally deficient diets. The Purina Equine Research team recently completed a thorough, long-term study that looked at the efficacy of yeast in enhancing fiber digestion in horses, as well as several other parameters, and the data indicated no effects of yeast on fiber digestion. This data is currently being prepared for submission for publication in a scientific journal. However, ongoing Purina research continues to investigate potential effects of yeast products on other parameters of equine digestion, health and performance. Yeast products can be a source of quality nutrients, including essential amino acids and B-vitamins, so adding yeast products to a nutritionally deficient diet will result in improved performance in horses, just as addition of any ingredient that supplies deficient nutrients to a ration will result in improvement in performance. However, when yeast products are added to diets that are nutritionally balanced and fortified to meet a horse’s nutrient requirements, the additional nutrients provided by the yeast products have not shown measurable benefit. At this time, there is insufficient data to support the inclusion of yeast products in horse feeds for benefits other than those simply provided by the nutrient content of the yeast products, and there are many other feed ingredients that provide quality nutrients for optimal nutrient content in horse rations. Purina Premium Horse Feeds are nutritionally fortified and balanced with quality protein sources as well as specific essential amino acids, minerals and vitamins to meet horses’ nutritional requirements when fed as recommended. And, of course, if and when we elucidate beneficial effects of yeast products in horses, we will share those findings with our customers and add them to our feed formulations. This entry was posted on Thursday, March 22nd, 2012 at 9:45 pm	and is filed under Horse articles. You can follow any responses to this entry through the RSS 2.0 feed. Responses are currently closed, but you can trackback from your own site.